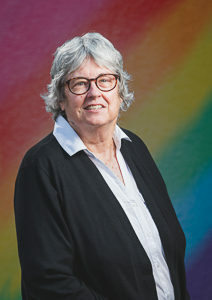 Bettie Owen retired in 2017 as Vice President of Digital Production at Wolfe Video in San Jose, CA. Wolfe Video, founded in 1985 , is the largest exclusive distributor of lesbian, gay, bi and transgender (LGBT) films. Once Wolfe signed a film to their label, Bettie managed many aspects of the project to get it out into the world (on streaming platforms, cable TV, DVD, and more.) She worked with independent filmmakers, designers, tech houses, printers, and many others to make this happen. Previous to coming to Wolfe, Bettie sold commercial printing and graphic design services in San Jose; and before that, she managed a large recreational program for the YMCA of Charlottesville, VA.
Bettie has a Master’s of Science is Mass Communication from San Jose State.